It has a naturally oily hair is a challenge because the treatment is much more complicated than other hair types. 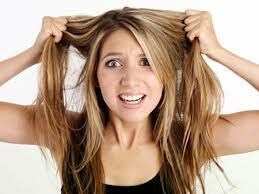 Oily hair refers to the condition where the scalp to produce excessive amounts of oil. This oil then make the hair look flat and uninteresting. In addition to making hair look dull, excess oil also makes dirt and microbes easily attached to the hair. If left unchecked, the microbes will make your hair dandruff and fragile. Oily scalp is troublesome, but who's to say could not be overcome? From Where Oil Originally In Chief? Naturally, we are equipped with the scalp oil glands called sebaceous. The main function of this gland that produces sebum. Sebum itself serves to protect the scalp moist. For some conditions, the production of excess sebum makes hair look greasy. This could be caused by hormonal changes, emotional stress, dietary factors, and genetic factors. Consumption of fruit for nutrition oily hair is to consume nuts, such as almonds or soy nuts. Two kinds of beans is able to absorb the excess oil is not only the body but also able to absorb the excess oil scalp section. There are several effective ways to overcome problems caused by excess sebum production is. The first way is easiest to wash it every day a maximum of two times. Use a shampoo that is free of oil content. Observe also the content of these shampoos, lest there is an element such as Silico and lanolin. As much as possible do not use shampoos and conditioners that have been incorporated in a single bottle. Conditioner is recommended, but choose products that is separate from shampoo conditioner. Furthermore, even the use of conditioner is recommended only at the end of the hair. Another step you can do is always to cover her hair when going out of the house. Exposure to sunlight makes your oily hair worse. Coupled with dust, microbes and pollutants that easily attaches to limp hair condition will worsen the condition of your hair. The next tip is do not often hold your hair because it will make the hair more oily. Another way that you can apply is the use of masks combined with lemon yogurt. Mixture of these two materials was allegedly able to overcome the excess oil on your scalp. The trick is to spread the batter mixture of lemon and yoghurt and leave for approximately 30 minutes. After that rinse clean. In addition to dealing with the excess oil, this recipe also reportedly can prevent dandruff on the scalp. Another suggestion is that you can apply to reduce the use of hair serum. Because serum will make the condition of the hair limp and greasy. If you can not be separated from the serum, try to use enough in the evening before you sleep. Using serum during the day will make the dirt more easily perch on the oily scalp. The last tip is, reduce the frequency of your hair. Because with combing, indirect oil in the scalp will carry over to the hair shaft. 1. Use a special shampoo for oily hair or containing ph neutral. 2. Use in sufficient quantities (depending on thickness of hair). Do not leave on too long. The sooner you rinse, the better. 3. Do not use baby shampoo or for children. Indeed many assumptions shampoo baby or child is very gentle and safe. However, this shampoo contains oil that is not suitable for youth or adult hair. 4. Avoid using hot water when shampooing. 5. Do not use a hair dryer too close to the hair root. 6. When shampooing should massage your scalp gently (not too long) before applying shampoo that contains shampoo sink in and clean up excess oil on the scalp and hair roots. Rinsing was done with cold water until the roots of the hair. 7. When drying hair, pretty pressed-press until half dry, and let it dry naturally. If you want to use a hair dryer, use a low temperature. Hold with a distance of 15 cm from your hair. And do not let the hair dyer is in the same hair over 15 seconds. 8.Gunakan comb of ivory or plastic or wood with rare gear. 9. Also avoid the use of hair styling products too often. These products makes the hair will become limp. Also to add in, avoid using of conditioners on your roots for it will just add up to the produced oil in the hair. Oily scalp treatments should be regularly followed and applied to fully recover from your current situation.